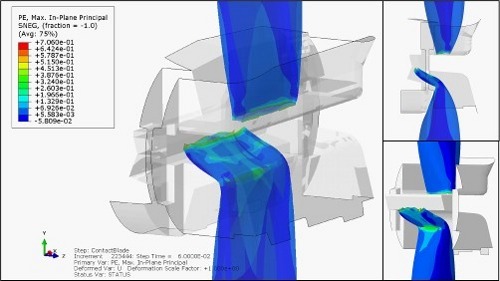 DNV uses Abaqus finite element analysis to study blowout scenarios. Image 1. Deepwater Horizon oil rig before April 20, 2010. On the evening of April 20, 2010, Deepwater Horizon suffered a blowout while drilling in the Macondo Prospect, an area in the Gulf of Mexico 40 miles off the southeast coast of Louisiana. The platform caught fire, 11 crewmen were killed, and two days later the rig sank. Numerous attempts were made to seal the well, but oil continued to spew into the Gulf until July 15, when a temporary cap was put in place. Relief wells then pumped concrete into the area underneath the wellhead, and the well was deemed permanently sealed in mid-September. Deepwater Horizon was a semi-submersible, dynamically positioned drilling platform, or mobile offshore drilling unit (MODU). In layman's terms, it was a huge floating oil rig, capable of adjusting position under its own power, and designed to operate in water up to 8,000 ft and drill wells nearly 6 miles deep. Blowouts occur when pressurized oil and gas flow uncontrolled up the drill pipe or riser to the rig, posing extreme risk to the people operating the rig, as well as possible damage to the environment and the platform itself. 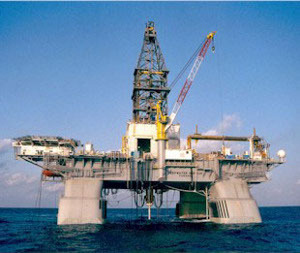 To prevent this situation, modern rigs are equipped with blowout preventers, or BOP stacks, huge structures that sit on the sea floor directly over the wellhead (see Image 2). The drill pipe passes through the BOP stack, which contains a number of mechanisms -- shear rams, bore rams, annular preventers, and a host of electronic and hydraulic assemblies -- that are supposed to shut the well down safely in the event of a blowout. Image 2. Schematic view of the BOP stack seen from Deepwater Horizon's port side. During the initial event and in the weeks after Deepwater Horizon sank, numerous attempts were made to activate the BOP stack -- initiation of the emergency disconnect sequence from the failing rig, automated dead-man circuitry on the BOP stack, even remotely operated vehicles working directly on the stack's "autoshear" function, 1 mile down. Nothing stopped the flow of oil. The U.S. government moved quickly. Even while the oil industry was working to shut down the well and contain the spill, the Departments of Interior and Homeland Security signed an order to begin an investigation. In August, they released a competitive Request for Proposal (RFP) for an analysis of the BOP operation and failure to seal the well. On September 1, DET NORSKE VERITAS (U.S.A.), Inc., Columbus, Ohio, office was awarded a contract to determine the performance and possible failure modes of the BOP stack. DNV pulled together an expert team of 40 individuals in forensic investigation, materials specialists, BOP operation, systems controls, and computer modeling from its Columbus, Ohio, Houston, Texas, and Hovik, Norway, offices to address all issues involved in this multidisciplinary investigation. DNV had a tall order. Their contract charged them with "determining the performance of the BOP system during the well control event, any failures that may have occurred, the sequence of events leading to failure(s) of the BOP ... ." To meet this challenge, the DNV team assembled a base of operations at NASA's Michoud facility in New Orleans. The intervention vessel Q-4000 raised the BOP stack and delivered it to a temporary enclosure there. The investigation was underway. Shane Finneran, project engineer and team lead in the Computer Aided Engineering (CAE) Group at DNV's Materials and Corrosion Technology Center, Dublin, Ohio, was a key player in the investigation. His team was involved throughout the Deepwater Horizon Blowout Preventer Forensic Examination, leading the 3D laser scanning and computer modeling initiatives and assisting with materials evaluation and damage assessment. FEA provided DNV with a rapid, accurate methodology to simulate and evaluate the likelihood of proposed scenarios, many of which would have been difficult and impractical to assess with physical testing. "It would be extremely difficult and generally cost prohibitive to run physical tests under the same conditions that exist two miles under the ocean, re-enacting a blowout scenario," says Finneran. "Typical physical testing involves shearing pipe with no backpressure and no product flow. You're proving that the blind shear ram can shear pipe and that the rams close properly. However, FEA can provide the means to perform extensive simulations of many types of damage -- ranging from simplified deformation and buckling to post-buckling deformation and shearing -- with realistic pressure and force measurements built into those simulations." A 200-page report published by DNV for the Department of the Interior's Bureau of Ocean Energy Management, Regulation, and Enforcement (BOEMRE) explains in great detail the reconstruction process and test methodology used by DNV, as well as their findings. The BOP stack, together with several pieces of drill pipe, was raised from the well site (image above) and transferred to a holding facility at NASA-Michoud. The team cleaned, photographed, and cataloged the stack, disassembling where necessary to get at its inner workings. Hydraulic fluids and metal samples were taken for analysis; the stack's control mechanisms and their batteries, actuators, and solenoids were tested; and the casing and blind shear rams, variable bore rams, and upper and lower annular preventers were all visually inspected and 3D laser scanned. DNV then used the laser scans to construct as-is 3D CAD models of the damaged equipment, especially in the area of the BSR, the blind shear ram, which was the only ram on the BOP designed to cut the drill pipe and seal the well bore (see Image 4). Image 4. Photograph (top) and laser scans (bottom) of damaged blind shear ram (BSR). SolidWorks software, also from Dassault Systemes, was used to convert the original CAD files of the ram components into simplified surfaces for use with Abaqus FEA, enabling the team to simulate and virtually test their theories of what happened. Simply put, a drill pipe is a tube within a tube. The outer tube is the bore of the well, and the inner tube the drill pipe, which in turn contains the drill head. As the drill head rotates and moves down within the well bore, pumps aboard the drill platform force a viscous fluid called mud down with it. The mud lubricates and cools the drill head, while simultaneously flushing dirt and cut bits of rock out the bottom into the ring-shaped 'annulus' space between the drill pipe and the outside tube, or casing. Mud can also be pumped from other locations -- choke and kill lines, for example -- so debris and mud may flow back up the drill pipe. However it gets there, the debris is eventually sent back to a separation manifold on the drilling platform for cleaning and reuse. 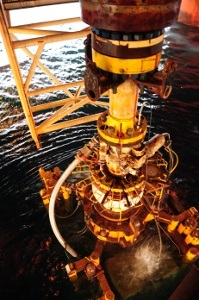 The huge BOP stack sits on the sea floor directly above the wellhead. Its two halves together are as tall as a six-story building and weigh over 400 tons. The top half, called a Lower Marine Riser Package (LMRP) contains two electronic control pods together with a pair of donut-shaped sealing devices called the Upper and Lower annular preventers. The preventers seal around the drill pipe and regulate upward fluid flow. The lower half of the BOP stack contains a series of shear and bore 'rams,' and the valves and hydraulics that actuate them. Depending on the circumstances, these rams serve to 'choke' the well, or 'kill' it if necessary. The BOP stack is a complex device, and its job is critical: control pressure within the well, keep the drill pipe centered, and sever and seal the pipe in the event of an uncontrollable blowout. The Deepwater Horizon's BOP stack failed on all three counts. On the night of the accident, shortly after a routine "leak-off" test of the Upper Annular Preventer, manifold pressures on the drilling platform increased five-fold. Oil and gas then began spilling onto the platform deck, and the rig caught fire. Personnel aboard the Deepwater Horizon activated the Emergency Disconnect Sequence (EDS) in an attempt to shut down the well, but they were unsuccessful. The rig was abandoned a half an hour later. 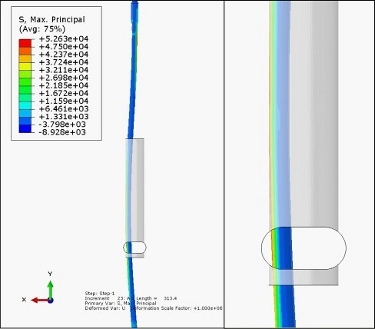 DNV's analysis, supported by FEA data, indicates that the primary cause of failure was the BSR, or blind shear ram's inability to cut the drill pipe and seal the wellbore. The BSR is like a big pair of scissors, with opposing blades designed to cut the drill pipe and seal its end in a last-ditch effort to kill the well. FEA clearly showed that the shear ram should have been able to do its job. The required force was in the middle of the test and calculated data range for a nominal, centered pipe model, and there was nothing out of the ordinary with the strength of the drill pipe itself. The BSR would likely have worked, except for one thing: the pipe wasn't where it was supposed to be. When activation of the blind shear rams occurred during ROV intervention, the annular preventers were already sealed around the drill pipe at the top of the BOP stack. The variable bore rams were sealed around its lower half. The pipe should have been in the center of the well bore, which is where the blind shear ram expected it to be. 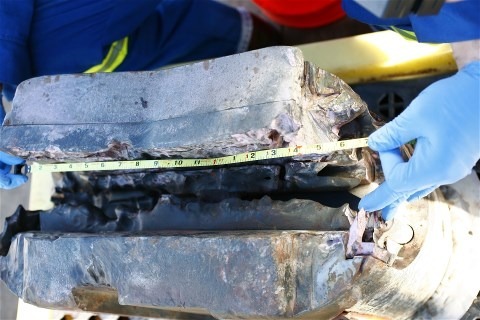 However, physical evidence from the markings on the recovered portion of the drill pipe indicated that the pipe was at the side of the wellbore instead. 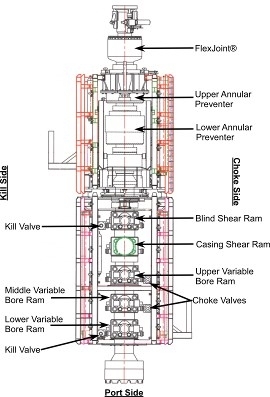 The DNV engineers postulated a reason: One of the pipe's tool joints was positioned just below the upper annular preventer, which was closed on the drill pipe. When upward pressure became high enough due to the forces caused by the blowout, the pipe had nowhere to go and the upward forces (compression forces on the drill pipe) caused the drill pipe to buckle -- pushing the pipe to the side of the wellbore. The blind shear ram tried to cut the pipe off-center, unsuccessfully. This jammed a portion of the drill pipe between the ram block faces, preventing the rams from fully closing and sealing the wellbore. As DNV's investigation into the proposed sequence of events deepened, FEA continued to support the team's theories. They started with a buckling analysis to determine what the necessary load would have been to move the pipe to the edge of the casing. The FEA models indicated that the applied pressures would have been sufficient to force it out of position (see Image 5). Image 5. Abaqus FEA models affirm pressure-caused pipe displacement within the wellbore, predicting both pipe deformation and resulting stresses due to buckling. From there, it was necessary to determine two other things: would the pipe have sheared had it been in the correct position, and what forces were needed to shear it off-center? 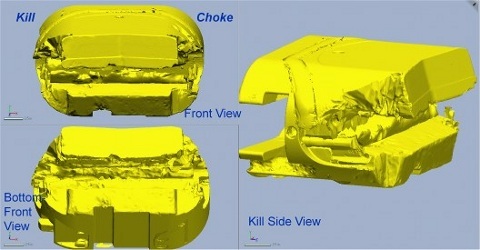 Once again, FEA models provided the needed insight (see Image 6). 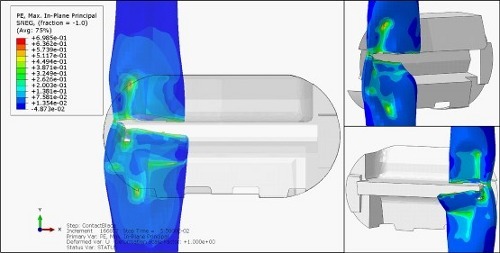 "First, using a combination of the shear damage parameters, in conjunction with the known elastic and strength values of the material, our FEA data validated the estimated pressures needed to shear the pipe under a center-load condition," says Finneran. Next, the engineers simulated the situation seen on the Deepwater. "Our shearing analysis showed that, with the pipe off-center, the rams would have been prevented from closing fully," says Finneran. "This allowed flow past the blind shear rams and caused significant erosion of the blind shear ram components and wellbore." Image 6. Abaqus FEA models showing the interaction between the drill pipe and the blind shear ram (BSR). Top image shows the complete shearing of the pipe when properly centered. Bottom image shows what happened when the blade did not fully engage the pipe because the pipe was not centered in the wellbore. The lateral forces due to buckling below the BSR pushed the pipe off center and caused the closing rams to deform the pipe rather than shearing it. "We determined that, under blowout conditions of this well, it was possible for the drill pipe to buckle between the UA (Upper Annular Preventer) and U-VBR (Upper Variable Bore Ram)," says Finneran. The DNV hypothesis was supported by their off-center BSR shearing FEA model, which provided results consistent with those damaged pipe segments, as well as the erosion damage seen between the rams, wellbore, and recovered drill pipe. Now that FEA has been shown to be highly useful in helping identify the causes of the Deepwater Horizon failure, Finneran would like to see it used to lessen the likelihood of such events re-occurring in the future. "I believe finite element analysis can be a valuable tool in validating the capabilities of both new designs and existing equipment," he says. "It allows you to incorporate a number of scenarios and situations that are difficult, if not impossible, to analyze through experimental testing." Finneran points out one challenge still to be overcome: incomplete raw material data. Because some of the material damage parameters of the actual materials used in Deepwater's BOP stack were unavailable, he and his team had to substitute equivalent materials with known values in their analyses. "The industry as a whole would benefit from developing material-specific data that could help them to further fine-tune the FEA of their designs," he says. "This could enable the development of models that can verify the ability of existing and future BSRs to shear drill pipe under high-pressure blowout conditions. Given the appropriate material data, this kind of numerical modeling definitely has the ability to assess the extreme pressures and conditions that may be seen during a blowout event." The DNV report makes numerous recommendations to the oil industry, including further studies to determine efficacy of back-up systems and ROV effectiveness, as well as additional FEA modeling to more fully understand buckling stresses and fluid dynamics in a blowout situation. "Whatever the outcome of this testing, regulations are expected to change," says Finneran. "Several alternatives are being considered within the industry, such as including redundant BSRs as a secondary backup, and pursuing more robust designs capable of cutting and sealing under most any situation presented." "FEA can incorporate real-world data into highly accurate predictive models," Finneran says. "Given the right material data, fluid flow characteristics, and downhole pressures, we could then simulate what would happen under those conditions, giving you a reasonable amount of certainty that your design will function under well blowout scenarios." Finite Element Analysis (FEA) is a widely accepted computer simulation methodology for modeling, evaluating, and/or optimizing a product's mechanical and structural design. The technology has a long history of effective use within the energy industry as well as the aerospace and automotive sectors. Engineers generally start with a 3D CAD model -- perhaps of an oilfield pipe installation, an airfoil, or the chassis of a car -- and then use FEA software to transform that model into a 3D mesh of geometric units, which are the 'elements' in finite element analysis. Each element is assigned a distinct size and shape mathematically representing a finite section of the model. Linked together by nodes that quantify their interrelationship, the elements (which can number in the hundreds of thousands or even millions) are further constrained by boundary conditions, material characteristics, and a host of other inputs dictated by what type of product or structure is being modeled. Once an FEA model is set up, any number of static, dynamic, linear or nonlinear events, including contact, collisions, buckling and/or collapse scenarios, and even multiphysics analyses (thermal-structural, fluid structure interaction, and/or computational fluid dynamics), can be simulated and analyzed. Feedback from the FEA solution ('virtual testing') can then be used to evaluate and modify the CAD design, repeatedly if necessary, until the desired product functionality and durability are reached. Alternatively -- as in the case of the Deepwater Horizon accident -- FEA can be employed in a retroactive way to forensically examine computer models derived from scans of damaged oil well components in order to identify what kinds of events may have caused the damage. Want more information on what Abaqus can do? Click here.